US Coast Guard Sector Honolulu conducts Maritime Law Enforcement, enforcing Federal Law throughout the Hawaiian Islands and surrounding water. Always prepared, 24/7, the Coast Guard protects the maritime economy and the environment, defends our maritime borders, and saves those in peril. 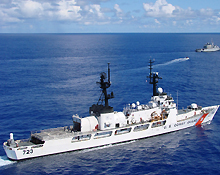 Welcome to Coast Guard Sector Honolulu!